Androgenetic Alopecia - Causes, Symptoms, Problems! Androgenetic Alopecia: Big Problems with the Current Theory! There’s a lot more to androgenetic alopecia than just your genes. The hormones testosterone and its derivative dihydrotestosterone are, along with genetic factors, responsible for causing this type of hair loss in over 80% of men and about 50% of women. In fact, this is by far the most common type of hair loss affecting millions of men and women around the world. So why does it affect so many? This page examines the causes of androgenetic alopecia (hormones and genetics) that can answer that question, and reveals some big problems with the current theory for this type of hair loss. There’s also an in depth look at symptoms including the hair loss classification scales (Hamilton-Norwood scale for men and Ludwig scale for women). 1. How these hormones act. 2. How they fit in with the current theory. 3. How these hormones are produced. Testosterone and dihydrotestosterone (DHT) are steroid hormones (androgens) and, as such, have an anabolic effect. In other words, they make things grow. That’s why, during puberty when levels of these two hormones increase, men experience a big surge in bone and muscle growth. However, these hormones also promote the growth of hair (testosterone develops pubic hair growth, and dihydrotestosterone develops facial and body hair growth). So how can these hormones be linked to both hair growth and hair loss? The current theory was developed after it had been observed that castrated men (eunuchs) tend to keep their hair and not suffer male pattern baldness. Clearly then, without normal levels of testosterone and dihydrotestosterone, hair loss will not develop. Hair follicles in the hair loss region of the scalp appear to contain more androgen receptors and 5-alpha reductase than in the rest of the scalp. The enzyme 5-alpha reductase converts testosterone into dihydrotestosterone (which is about five times more powerful than testosterone). Dihydrotestosterone then binds to the androgen receptors much more so than does testosterone, and accumulates within the hair follicles. Increased levels of dihydrotestosterone can be found in the hair loss region of the scalp in people who suffer androgenetic alopecia. All of which led to the current theory which states that high levels of dihydrotestosterone must be responsible for the miniaturization of hair follicles and the hair loss which then develops, but exactly how dihydrotestosterone does this is not known. So that explains how dihydrotestosterone fits in with this type of hair loss. But how is this hormone produced? The very simplified pathway below shows how testosterone and dihydrotestosterone are formed in both men and women. From this pathway you can see that these hormones are derived from cholesterol. And cholesterol is, of course, derived from the foods we eat. It follows then, that the more foods you eat which get processed into cholesterol, the more testosterone, dihydrotestosterone and, ultimately, hair loss you might develop. This is the main connection that food has with androgenetic alopecia. To learn more about the link between hair loss and food, read this page. Several genes have been identified which are connected to androgenetic alopecia in some way. These include the 5-alpha reductase and androgen receptor genes (the relevance of which was explained in the last section). However, it's widely accepted that the genes which actually initiate this condition remain unknown. And, as such, the current theory simply states that hair follicles must be "genetically programmed" for hair loss. Skull expansion (skull bone growth) causes hair loss. Most men suffer quite severe hair loss from androgenetic alopecia. This often develops as receding temples at the front or a bald patch at the back. And when areas of baldness form both front and back, this usually develops into the full male pattern baldness profile. Although men can suffer extensive areas of baldness at the front, back, or both, in some cases they might just develop thinning hair instead. So why do all these different regions and varying degrees of hair loss emerge? The current theory gives no real explanation – it simply states that the hair follicles must somehow be "individually programmed" in one region of the scalp but not in any other. Women produce much lower levels of testosterone and dihydrotestosterone than men. This, along with genetic factors, explains why most women do not develop areas of total baldness whereas most men do. 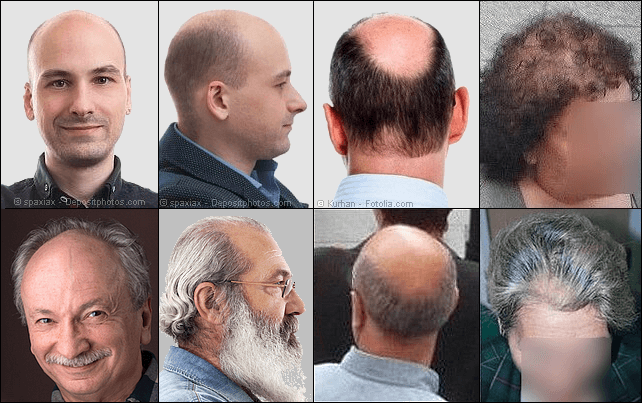 Instead, women usually experience androgenetic alopecia as female pattern hair loss whereby thinning hair develops in the same region as men (see photos on the left below). 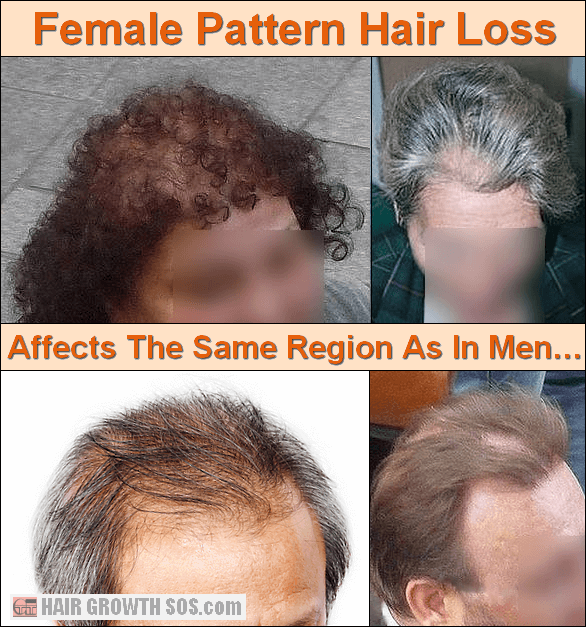 However, in the photo of the lady on the right, you can see that an area of baldness has developed in the frontal region, rather than evenly spread-out hair loss across the scalp. So, for some women, severe pattern baldness will develop. The many different patterns of hair loss in men and women have been formally classified, as explained below. Anterior - Addresses recession of the entire front hairline (i.e., not just the temples). Vertex - Addresses early-stage baldness developing on the top of the head. A further modified Hamilton-Norwood scale also exists whereby a stage II vertex version has been added (not shown in the diagram). 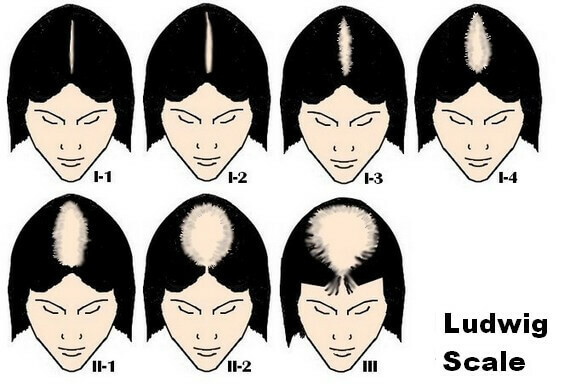 For women, the Ludwig scale can be used to show androgenetic alopecia development and is largely based upon the width of a middle parting to indicate the extent of hair loss, as you can see from the diagram below. 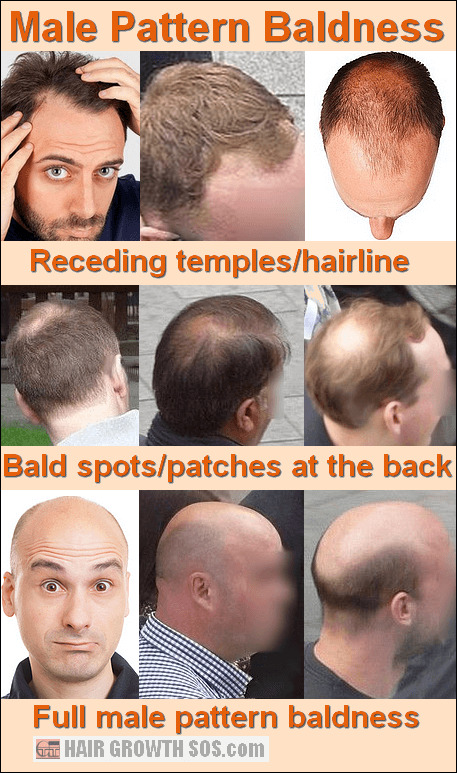 Advanced hair loss (female pattern baldness on the crown). Frontal hair loss (temples beginning to recede). Note: Both these versions are quite rare in women and are not shown in the diagram below. 1. Notice from the Ludwig scale that the area of hair loss in women is exactly the same as it is in men whereby the sides of the head remain unaffected. This differs from telogen effluvium which causes hair thinning across the whole scalp. 2. 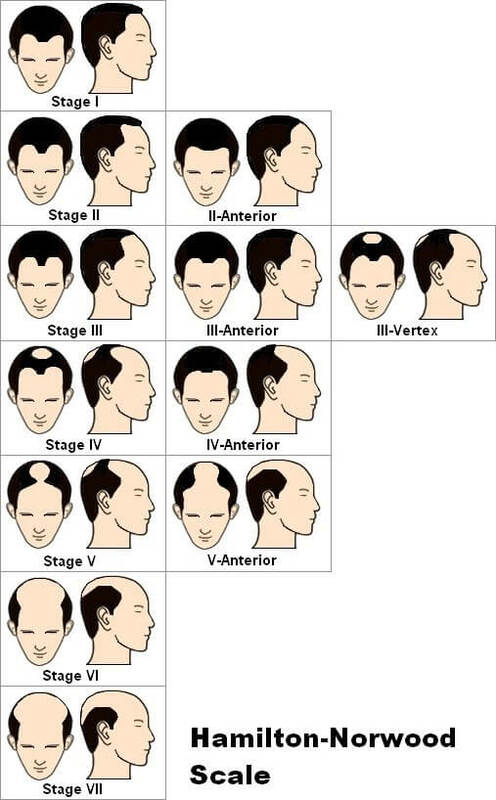 The Hamilton-Norwood scale has more stages than the Ludwig scale – this reflects the greater variety and severity of hair loss in men than in women. 3. The first image in each diagram represents no apparent hair loss. Mild - You notice an increase in hair loss (e.g., comb, basin, pillow) but no one else does. Most likely to apply if your hair loss has only recently started. Moderate - Thinning hair and reduced hair density makes your hair loss noticeable to both you and others. Can apply to rapid or medium-term hair loss. Severe - Your scalp clearly shows through your remaining hair, and you might even be completely bald in some areas. Most likely to apply to long-term hair loss. This page has highlighted some serious problems with the current theory for this type of hair loss. And these problems need to be solved before androgenetic alopecia is fully understood. However, my own skull expansion theory does address all these problems. And, in so doing, it can fully explain how androgenetic alopecia develops. Learn how skull expansion explains male pattern baldness genetics? "I have been doing the exercises for 3 months. Sir I've got very good regrowth of hair in my previous areas of hair loss i.e in the temple regions as happened with you. I can see more hair is coming in my head day after day. I'm 21 yrs old. Thank you."